So a friend once told me that whenever there is something good, the devil will try to work it’s way in and take hold. You have to hold faith in your heart to keep him out. I believe the devil and doubt both work in powerful ways. Last night John talked a lot about keeping doubt from creeping in, I believe doubt is the work of the devil. Today while John was getting ready to shave he came out of the bathroom lathered up in shaving cream to give Gabby a smile. She commented that he looked like Santa. John went back in the bathroom and instantly broke down. Doubt got the better of him! Today I had a startling discovery. Three weeks ago we saw Gabby with a balance problem and a speech issue. At that time, she was your typical 5 year old spunky, stubborn, moody, caring, playful little girl. It is really devastating to see the transformation that has taken place over a few short weeks here in the hospital. She has a hard time talking, she can not walk or sit up unassisted, she can only eat soft foods, she does not have coordination in her left hand, and she sometimes seems like she is staring off into space in a total daze. We are having a very hard time thinking about then and now. Once again, doubt has crept in. So to get to my discovery, I realized today that we need to celebrate the things she could not do yesterday but can do today and not think about 3 weeks ago. By holding faith in our heart we were able to see that she sat on the floor with me and played with Play Doh. She sat in her chair during all three meals and ate sitting up. She actually laughed when my mom was moving her legs like she was on a bicycle. She worked with the Occupational Therapist and put her own nightgown on. I know these might sound like small even trivial things, but in our new world, these were great improvements. 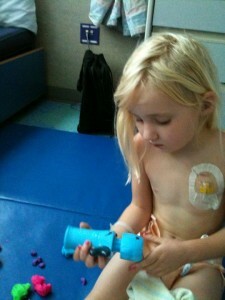 Tomorrow we will be starting to pack up her things to move one more time within the walls of Children’s Hospital. Gabby will be starting a more intense therapy program to help her regain some of her strength and abilities before we go home. We will continue her new morning routine of Chemo medicine and the LONG journey across the street for her radiation treatments. If all goes according to plan we should be arriving back in her room before 10am every day. They will come up with a therapy schedule that will work with her treatment plan to start her building up muscle control and hopefully give her the positive reinforcement for her to continue to strive forward in her progress. Once again, we are holding faith in our heart that this is the right place for her now instead of at home. We need to hold this devil at bay and keep the faith in our heart to help our daughter and our family get though this chapter in our life. I BELIEVE!! And my thoughts and prayers have been with Gabby and all of you. I can’t imagine what you are all going through. But I know faith will see you through, and Gabby will soon play happily again. Thoughts become things. Thinking of you and your great family. Good morning! 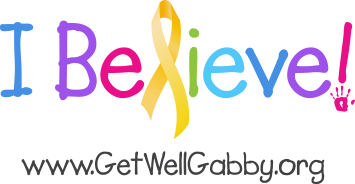 I know we haven’t met – Gabby’s page was forwarded to me by the Love Transfusion folks. I am a pediatrician in Lancaster, PA but lived in the Philly area (Rosemont/Bryn Mawr) while I was in medical school. As soon as I read about Gabby, I immediately thought of my friend Woody Wolfe, an amazing man who travels to children’s hospitals singing and performing magic, and just loving on kids and families. He lives in the city where I did my pediatric residency, so I got to spend a great deal of time with him, even traveling to Ukraine to do mission work with him. Anyway, he comes to CHOP regularly, so I have asked him if he might try to meet Gabby. There is a possibility he will be at the hospital tomorrow, if not he will be there in a couple of weeks. He has brought joy to so many families going through the most difficult circumstances imaginable, and I so hope you will get to connect with him! You can also see his website at hearttohandministries.com. I know it has been a long time since we have seen each other but I have been thinking about you ever since I heard the news about Gabby. I wanted you to know that I was thinking of you and praying for your strength. Gabby is beautiful…she looks exactly like you. Keep the faith! I will be mailing a donation to your home. I know it is not much but want to contribute in some way.